Yesterday we had a photo of Russian and Nazi officers posing together being in friendly relations – just before Nazi invaded Russia. Today someone submitted us a photo from a family archive which was made already during the Nazi invasion to Russia. 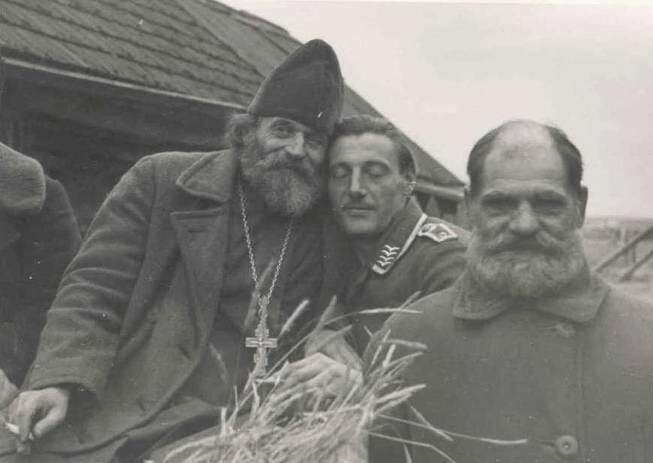 Russian Orthodox Christian priest and a Nazi German officer looking like old-time pals. Maybe that’s because Soviets oppressed church in Russia but Germans came and they started feel themselves free? But Germans were catholics and it was not so easy for them to accept another branch of church. Who knows, too many lies were issued by governments and too much truth was concealed. The priests seem to be wearing military uniform winter coats. The one on the left is smoking a cigarette, I have not seen that before. The German soldier is actually wearing Luftwaffe rank, perhaps a member of the Herman Goering Division. This photos are from the past, but but fascism is still alive in Estonia! What kind of subversionist Israeli propaganda is this? To contribute personally to the welfare of the world you are so concerned about, Boris, and to improve the lives of people in many countries, I encourage you to take direct action and play in traffic. after WWI, the treaty of versailles banned germany from having an airforce or any tanks. this was mainly due to france’s interest in keeping it’s archenemy weak, arguably in order to oppress it’s neigbour, as it happened i.e. when they invaded the Ruhrgebiet later on. never again should there be a war coming from germany, is i think what the treaty roughly states. the germans and the soviet union where both outlaws at the time, so they would collaborate in their isolation. germany would export know-how to the technologically backward CSSR and send troops over to train there on tanks and airplanes. during that time a lot of fliegervereine and sportvereine where founded, where people would fly gliders, which where not banned by the treaties, and do sports. these where effectively military training facilities undermining the treaty of versailles. the german concentration camps where at first spin offs of the soviet gulags. SS-officers where sent to russia for internships in the gulags in order to learn how to set up and organize such camps. by the way not all germans are catholic… in fact martin luther was “german” and the nazis wheren’t particularly religious. Heh-heh… 🙂 Priests do not smoke, dude! 🙂 This is definitely a fake. Yes, priests are forbidden to smoke. That’s a fake. They’re forbidden from molesting children too, that doesn’t stop them. you’re thinking of CATHOLIC priests– ORTHODOX priests are required to be married before being granted a chruch/parish, so no pedophilia for them. I was raised Russian Orthodox (in America), and knew several priests who smoked. The Nazists (national socialists – members of National Socialit German Labour Party NSDAP) did appear as big movement in 30thies of XXc.. Formerly they were small group of ideologists. As I see this photo was made before or just after WWI. If after so it was rather made abroad of Russia (Russia and Germany had lost the common border; in hot revolutionary times in Russia it was rathr immposible to exhibit crucifix or other religious symbols). In Hans-Ulrich Rudel’s ‘Stuka Pilot’ autobiography, he noted that the local Russians were surprised by the religious freedom they enjoyed under German occupation. They took their religious icons out of storage and displayed them. I guess they had to hide them once more when the Germans retreated. During WWI Tzar lost his power to govern Russia and quasi-democratic government was established. Few months later Bolshevicks saized the power and some symbols of tradition were demolished with a revolutionary passion. So if Germans retreated after lost war there wasn’t return of religonism but a new ‘quality’ of terror has appeared in Soviet Russia (and next USSR). As I know, many russians, who suffered under the oppression and dictatorship of Stalin regarded Germans as liberators. They enjoyed some kind of freedom which wasn’t giben before. Of course they didn’t know anything about Nazi ideologies. And later on Stalin succeeded to get their support for the war against the Germans, since the war was represented as a war for their homeland, and not for communism. I can only agree with what kori and Anna have been saying here. I am German,my family lived in Ukraine,when Hitler´s army invaded the SovietUnion in 1941.My grandmother told me,that when the Germans first came into the cities and villages,they were seen as liberators from communism and localpeople were waiting in the streets to give flowers to the soldiers. But this changed very quickly,when the Nazis started to establish thier terror regime in these occupied parts of the Soviet Union. So,this photo can possibly be from the early days of WW II. maybe you are forgetting nazis were not catholic, even christians, there´s no cristhian base in nazism, rather than a mix of several believes, paganism, mysticism, esoterics, and primitives forms of christianism, facts thats could close them to orthodox church more than the catholics ones. by the other hand, i dont believe in the middle of the war a priest give some importance to smoking or not. In the middle of the war it was not important was it really a priest or not, it could be just a drunk man with a stolen cross on his neck pictured by nazi to use as propaganda. Comon! Catholicism is the worst brunch of Christianity ever! 1. Cristian Wars in the middle age. 4. The Pope is sinless. During WW2 Catholics were on Nazi Fascist side. Catholicism is the worst brunch of Christianity and Catholicism discredited Christianity itself. i agree. catholics support nazis via Mussolini´s and Franco’s fascio, but Nevertheless nazi´s were not catholic. most of times catholics support the worst aberrations of humanity and to your list i would add all the crimes against humanity in south and centroamerica, from the conquest with the hole extermination of various ethnic groups till present with the support of military governments. I don’t advocate for evident crimes in America in XV and XVI c.. But cultures of Aztecs and Mays were related with horror cult murders. It wasn’t culture as in christian Europa (in fact, China, Hindoo, Arab, Africa etc. culture wasn’t similiar to the most humanitarian Europe). As I know many Indians wanted to be a christian when they hear it’s a belive in God who loves and who don’t want their children must be sacrified. Darek, many people in Poland were on the right side; I’m not using right side as a euphamism here – they had to kill Germans in order to destroy Nazism, it’s life. Many Catholic Poles worked to arm the Jewish resistance in the ghetto and got many of those who were being murdered to freedom, Poles, Jews, whoever. However, the Vatican, the heart of the Roman Catholic church, had a little deal with the Nazis and gave many of them a direct route to Argentina after the war and didn’t exactly condemn the Nazis when what they were doing came out in 1942. Maybe the Pope was a nice bloke, but why were Nazis allowed into Roman Catholic Italy and via the Roman Catholic Church into Argentina? Say what you like about individuals, but what happened happened. The same as the Swiss were ‘neutral’, but in reality they were anything but. Sara Abramov, you have proven yourself to be a 14-year old child without the slightest idea of what you’re talking about. There are LOTS more of these references to Jewish atrocities. When you grow up, please think about this before you declare Catholicism to be the worst religion. There is no doubt that this photo is fake. posed with the fake preist just for laughs. Why wouldn’t the German’s eyes have been open? I think the priests are most Cossack fighters dressed as priests. we are all brothers, whether we like it or not. I really hope people can understand that before its too late!! Please don’t say anything about history, guys. This is embarassing. Are you sure this is Russia and not (ex) Yugoslavia? Do not be so naive. Russian Orthodox priests were notorious in the past for their alcohol abuse – I wonder if they smoke when it suited them?